Michelle O'Neill will become the new deputy leader of Sinn Féin after it was confirmed she was the only candidate nominated for the post. The party's current Stormont leader will succeed Mary Lou McDonald as Sinn Féin vice president. The post became vacant when Mrs McDonald became the only candidate nominated to replace retiring party president Gerry Adams. Ms O'Neill and Ms McDonald will be formally confirmed in their new leadership roles at a special party conference in Dublin on 10 February. The MLA for Mid Ulster said she was "honoured". 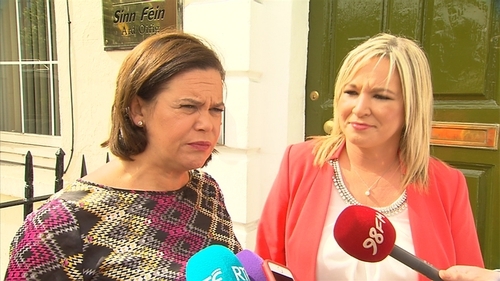 "I look forward after the Special Ard Fheis to work with our new party President Mary Lou McDonald and wider national leadership team," she said. "We are entering a new political era and Sinn Féin will continue to be on the front line leading positive change to improve the daily lives of ordinary people across Ireland. "Sinn Féin wants to be in government north and south to deliver high quality public services on the basis of equality, rights and prosperity. "We will continue to work against the twin threats of Brexit across the whole island, and British government austerity in the North. "Our priority is to continue the growth and development of Sinn Féin as a national political movement for Irish Unity and an agreed Ireland."